Al-Ṣirāṭ (Arabic: اَلصِّراط) is a bridge over the Hell that all people should cross on the Day of Resurrection. According to Islamic sources, this passage has some stations in which one's beliefs and deeds are evaluated. Due to their performance in this world, some people cross the bridge faster than others, and some people will stay there for thousands of years, and some of them will fall from the bridge to the Hell. The belief in Sirat is one of the basic tenets of Islam. In the Holy Qur'an, the words "ṣirāṭ", "ṭarīq" (Arabic: اَلطَّریق) and "sabīl" (Arabic: اَلسَّبیل) are very close in meaning: they all mean the path or the way. According to al-Raghib al-Isfahani, the difference between these three words is as follows: "sirat" is a main way or an obvious path, "sabil" is an easy, smooth way, and "tariq" is a way that can only be traveled on foot. According to 'Allama Tihrani, sirat is a metaphor for the closest internal path to knowing God. He maintains that every person has in oneself paths to knowing God. This is embodied in the resurrection as a bridge to the Heaven. He holds that the Infallibles (a) have traveled the closest and the fastest way to God, and this is why their way of knowledge is called "al-ṣirāṭ al-mustaqīm" (Arabic: اَلصِّراطَ المُستَقیم) (the right path); a path that is sharper than a sword and narrower than a hair string. The word "sirat" occurred 45 times in different verses of the Holy Qur'an, all in its singular form. And in 32 of these verses, the word is modified with the adjective "mustaqim" (right or straight). According to hadiths, the belief in sirat is a basic Shiite belief. In many cases, sirat is characterized in the Holy Qur'an by the adjective "mustaqim" (straight). In an interpretation of the well-known quote, "the paths to God are as many as people's souls", 'Allama Tihrani says that although there are many ways to God, the straight path (al-sirat al-mustaqim) is the only and the best path of closeness to God. Those different paths can take people to God insofar as they are close to the straight path. Given that there is only one straight path, Imam Khomeini writes that all the above are instances of one and the same path. The application of the straight path to humanity, its leader (the Prophet (s) and Imams (a)), the religion, and the bridge on the Hell is compatible with there being only one such path, since they are all paths to the Heaven and to God. According to hadiths from Ahl al-Bayt (a), sirat is a bridge over the Hell which is sharper than a sword and narrower than a hair string. The Hell mediates between people and the Heaven; all people should cross the bridge. Some of them cross it as fast as light, some cross as fast as a horse, and some crawl on it, and some cross it with a lot of difficulty while hanging from it, with fire on parts of their bodies. Some scholars assimilated the narrowness of sirat to Imam 'Ali (a)'s lifestyle that was very cautious with his painstaking attitude to comply with divine orders. Some hadiths that take Imam 'Ali (a) as an instance of sirat support such an analogy. It is not known whether sirat passes through the Hell or is placed over it. One difficulty of the sirat is that there are stations ('aqaba), or checkpoints, so to speak, on it. According to al-Shaykh al-Saduq, these stations are obligations and prohibitions that have to be observed in this world. Each of the stations is called after one of these obligations and prohibitions. If one failed to comply with any of these in this world, then he or she will be questioned for thousands of years, and if one complied with it in this world, then he or she will pass it fast to the next station, and so on to the Heaven. 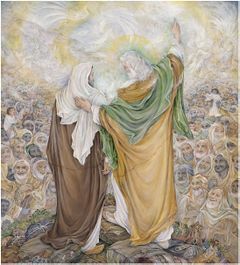 According to hadiths, the Holy Prophet (s) and Imam 'Ali (a) are the first people who cross the sirat. The material for writing this article has been mainly taken from صراط in Farsi WikiShia. This page was last edited on 19 July 2018, at 12:35.